That is a giant stack of diapers! 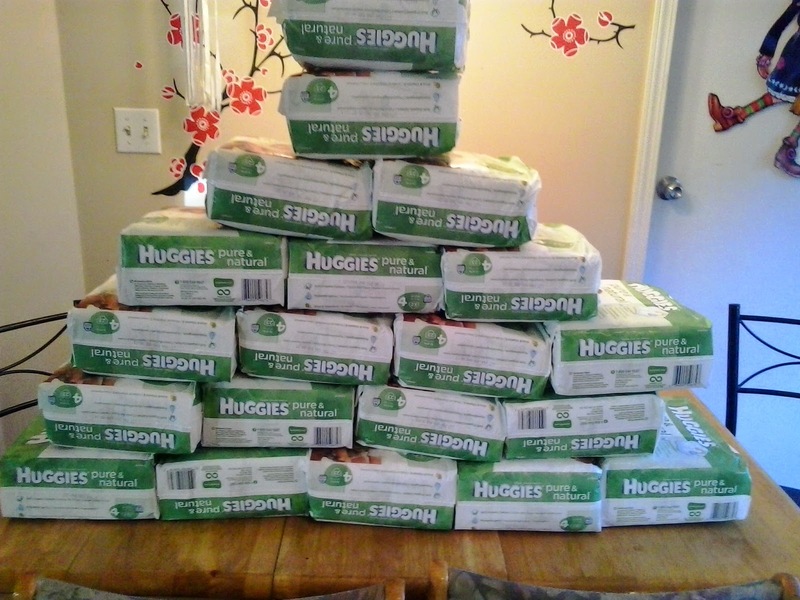 I won all 460 of those Huggies Pure and Natural diapers through Terracycle. For those of you that don' know about Terracycle they are an absolutely amazing company that recycles all kinds of different packaging and materials and they make it so easy for you to get involved. They give you printable shipping labels for whichever item you signed up to recycle and give you points and chances to win stuff in return. TerraCycle is a proud triple-bottom line company. Founded in 2001 by Tom Szaky, then a 20-year-old Princeton University freshman, TerraCycle, Inc. began producing organic fertilizer by packaging liquified “worm poop” in used soda bottles. Since the inauspicious start, TerraCycle has become one of the fastest-growing green companies in the world. Today, TerraCycle is a highly-awarded, international upcycling and recycling company that collects difficult-to-recycle packaging and products and repurposes the material into affordable, innovative products. TerraCycle is widely considered the world’s leader in the collection and reuse of non-recyclable, post-consumer waste. TerraCycle works with more than 100 major brands in the U.S. and 22 countries overseas to collect used packaging and products that would otherwise be destined for landfills. It repurposes that waste into new, innovative materials and products that are available online and through major retailers. TerraCycle benefits our planet in a number of ways. We divert billions of pieces of garbage from our landfills and incinerators (both of these options produce added carbon and other greenhouse gases) and either upcycle or recycle the waste into new products, which reduces the need for new materials to be extracted from our planet. TerraCycle is on a mission to eliminate the idea of waste. We do this by creating waste collection programs (each one is called a “Brigade”) for previously non-recyclable, or difficult-to-recycle, waste. The collected waste is then converted into new products, ranging from recycled park benches to upcycled backpacks. Please sign up and join us to create a better world. Terracycle asks for nothing more then your trash and provides so many benefits. Sign up and get started today no matter where you are in the world we can all get involved! SIGN UP NOW!